Apple TV facts: this device allows users to stream and watch videos, view photos, play music originating from Internet services as well as a local network. Consumers can access the iTunes Store directly through Apple TV to rent movies and TV shows and stream audio and video podcasts. Users can connect their computers on a local network to maintain a central home media library of digitized CD, DVD or HD content, provide direct connectivity to photo organization software such as iPhoto, limit home video access to a local network only, play Internet radio, or preload content on Apple TV to be used later as a non-networked video player. For users who wish to connect the Apple TV to a computer, synchronization and streaming modes are supported. Apple TV can also function as a peer-to-peer digital media player, streaming content from iTunes libraries and playing the content over the network. iTV or Apple TC: Apple started taking pre-orders for the Apple TV on January 9, 2007. The name “iTV” was originally going to be used to keep it in line with the rest of their “i”-based products (iMac, iPod, etc. ), but was not used. The British terrestrial broadcast network, ITV, already holds the rights to the name in the UK and threatened to take legal action against Apple. 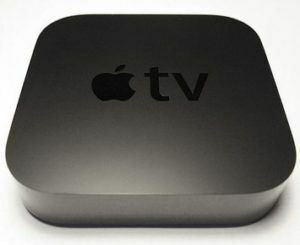 Stand-alone Apple TV: On January 15, 2008, Apple TV announced its major free software upgrade. As a result, the Apple TV turned into a device that no longer required a computer to run iTunes on Mac OS X, or Windows to rent or purchase content directly from the iTunes Store. Neither could you download podcasts or stream photos from Mac (MobileMe today) or Flickr. Thus, most of the Apple TV’s hard disk became redundant. Apple TV and Fire TV: Because Amazon.com is in competition with Apple with their Fire TV, they have declined to develop an application for the Apple TV. Amazon.com also stopped selling Apple TVs in its online store and removed all Apple TV SKUs a few weeks prior to the launch of the 4th Generation. Podcasts: Since 2008, podcasts have been served on the Apple TV as other kinds of video, as opposed to in RSS and similar feeds. HD iTunes Content: Until mid-March 2009, the Apple TV was the only way to purchase HD iTunes content. Apple TV can display photos from Flickr and iCloud in a slideshow, with automatic cross-dissolve transitions, and optionally with the Ken Burns effect. iTunes Remote App: On July 10, 2008, Apple released the iTunes Remote app on the App Store. Together with the Apple TV 2.1 software update, this improvement added recognition for the iPhone and iPod Touch as a remote control device. Later, updates added support for the iPad and introduced support for new features as they were added to iTunes. Apple TV Formats: Apple TV natively supports the following audio, video, and picture formats: Video – H.264 up to 720p at 30 frames per second (1st & 2nd generation), H.264 up to 1080p at 30 frames per second (3rd generation), H.264 up to 1080p at 60 frames per second (4th generation). High or Main Profile level 4.0 or lower, or High or Main Profile level 4.2 or lower (4th Generation), Baseline profile level 3.0 or lower with AAC-LC audio up to 160 kbits/s per channel, 48 kHz, stereo audio in .m4v, .mp4, and .mov file formats. MPEG-4 up to 720×432 (432p) or 640×480 pixels at 30 fps. MPEG-4 video up to 2.5 Mbit/s, 640×480 pixels, 30 frames per second, Simple Profile with AAC-LC audio up to 160 kbit/s, 48 kHz, stereo audio in .m4v, .mp4, and .mov file formats. Motion JPEG up to 720p at 30 fps. Motion JPEG (M-JPEG) up to 35 Mbit/s, 1280×720 pixels, 30 fps, audio in ulaw, as well as PCM stereo audio in .avi file format. Note: with the 4th generation, apps may use a built-in software in order to play other codecs and formats, e.g. Plex/ VLC Media Player. Synchronization Mode: Apple TV in synchronization mode works in a similar way to the iPod. It is paired with an iTunes library on a single computer and can synchronize with it, copying content to its own hard drive. Apple TV need not remain connected to the network after syncing. Photos can be synced from iPhoto, Aperture, or from a hard disk folder on a Mac, or Adobe Photoshop Album, Photoshop Elements, or from a hard disk folder in Windows. Parental Controls: Parental controls allow consumers to limit access to the Internet or media service content, via the “Restrictions” settings. Individual services can be turned off (e.g., to reduce clutter), icons can be rearranged via the tap-and-hold technique. Internet media is split into four categories: Internet Photos, YouTube, Podcasts, as well as Purchase and Rental. Each of the categories is configured by a parental control of “Show”, “Hide” or “Ask”, to prompt for a 4-digit PIN. In addition, movies, TV shows, music and podcasts can be restricted by rating. Apple has restricted access to most viewed charts on movies and podcasts. They are replaced by “Top Movies”, “Top Podcasts” and “Editor’s Picks”. PPC603-based set-top box: In the late 1990s, Apple designed a PPC603-based set-top box, but it was never released. They say that prototypes of this device surface from time to time. Apple’s Remote App: Apple’s Remote app on iOS devices allows the control of the Apple TV from an iPhone, iPad, or iPod Touch. The iOS remote app increases the accessibility of the Apple TV by enabling what’s called Switch Control. Switch Control is a unique Apple technology that enables navigation sequentially through onscreen items and performs specific actions; such as selecting, tapping, dragging, and typing. You can trade in your old Apple TV for cash at iGotOffer.com. We also buy other consumer electronics online as well. It’s easy and fast. For example, you can trade in your old iPhone, your iPad, iMac, MacBook, Mac Pro, or any other device for that matter: Sell Apple TV online now.